Riot police officers pen in protestors between large police vehicles. 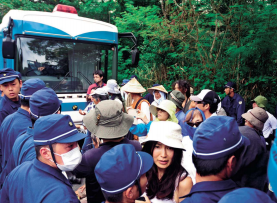 On August 22, riot police forcibly removed about 90 protestors who were blocking construction vehicles working on construction of new helipads in the Northern Training Area spanning Higashi Village and Kunigami Village in Okinawa. One man and one woman were injured in the confrontation and were taken to the hospital by ambulance. Riot police penned protestors in between police vehicles over the span of an hour, and some protestors complained of feeling sick in the heat of the day. 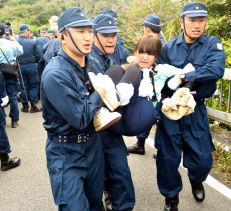 Riot police officers forcibly remove protestors on the morning of August 22 in Higashi Village, Takae. Construction vehicles were going to enter the Northern Training Area’s N1 zone gate, so protestors blocked Takae Bridge that connects Prefectural Route 70 to the gate. They did this by parking about 30 cars on the bridge in lines of two or three cars, sitting between their cars, and even laying under their cars to prevent the construction vehicles’ passage. Riot police forcibly removed sit-in protestors and towed cars, clearing Takae Bridge. At around 11 a.m. on August 22, about 20 vehicles related to helipad construction, including about 10 trucks hauling gravel, gained passage through the N1 zone gate. The two injured on this occasion were 87-year-old Henoko resident Fumiko Shimabukuro and a 63-year-old man from Ogimi Village. In a scuffle with riot police, Shimabukuro’s pinky finger on her right hand was gashed and required five stitches, with full recovery expected to take one week. The resident of Ogimi Village, who had been sitting between vehicles, was hit and held down by a riot police officer, the officer’s knee on his chest. He gave his account of the experience, saying that the officer’s use of force was excessive. The protestor, enraged, said that the officer kept up the pressure on his chest for two or three minutes. In the month since construction on the helipads began, the Japanese government has strengthened its firm posture on helipad construction. Okinawans are criticizing the government for pushing construction work forward as though it takes priority over Okinawans’ human rights. When construction of the helipads began on July 22, three people were injured and hospitalized. Now, the total number urgently transported to the hospital in relation to protest activities against helipad construction has reached five.